Hi guys! 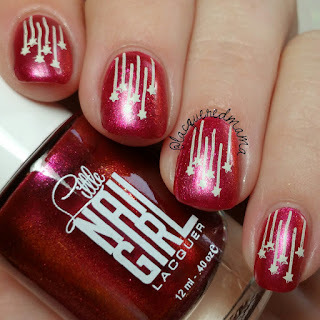 Today I have the gorgeous Holiday Vibe Duo to share with you from Littlenailgirl Lacquers! Both polishes are reminiscent of Christmas, yet aren't too overly festive, so they can really be worn year round! Let's have a look! Lucky Charm is a gorgeous light, sort of sea foam green filled with silvery shimmer and flakies that give it a metallic feel! 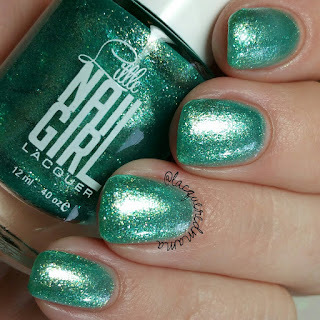 This had a really great formula that was opaque for me in two coats plus topcoat. It dried fairly shiny on it's own and because this is not glitter, it removed really easily. 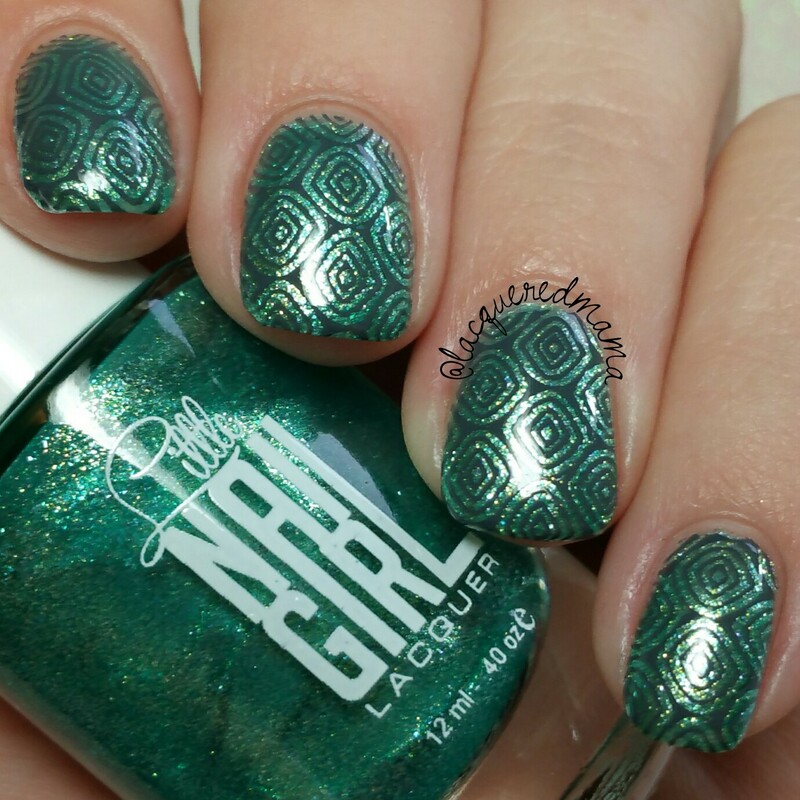 Lucky Charm stamped with UberChic Beauty Plate 13-03 using Mundo de Unas Dark Gray. 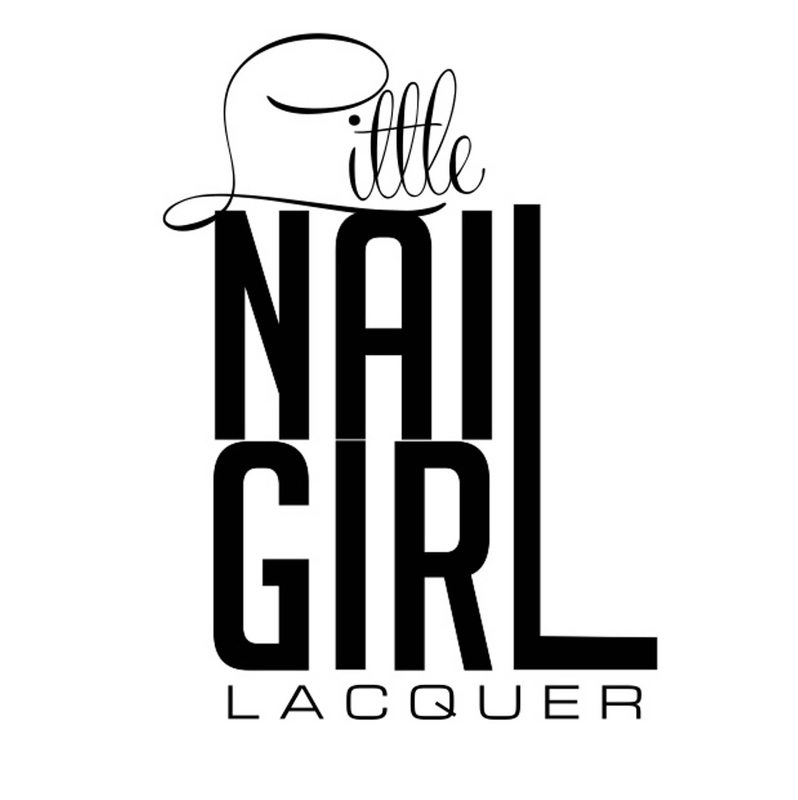 It Girl! 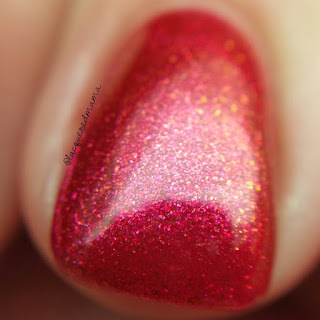 is a beautiful pink toned red filled with gold shimmer and micro flakes that give it a nice foil, color shift effect from pinky red to a bit of an orangey golden tone. Super pretty! This also had a really great formula that was opaque in two coats plus topcoat. Again, this one dried shiny for the most part, but topcoat really made it sparkle. It also removed really easily. Love both polishes so much! 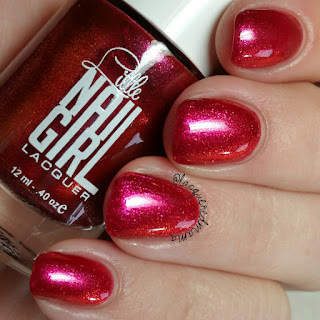 I think It Girl is definitely my favorite because I am a sucker for reds! The Holiday Vibes Duo is available in Littlenailgirl Lacquer's shop for $18.00, but it's currently on sale for $15.00 + if you use code LM at checkout, you'll receive an additional 10% off your order! 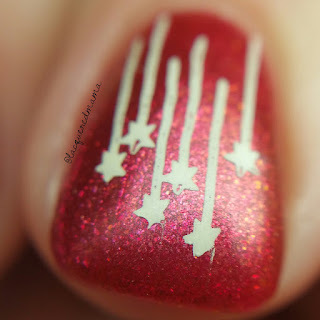 That red mani is so pretty! I have never heard of this brand. I am loving the micro flakies in these. I like the polishes but I love the stamping! So fun!